How to celebrate Guru Purnima in school is an important part of Guru Purnima celebrations. In fact, Guru Purnima is the festivity dedicated to knowledge, the day in which students have to salute and thank their spiritual and academic teachers. Schools and colleges are repository of knowledge par excellence, hence learning how to celebrate Guru Purnima in school is very important both for students and teachers. Schools across India and Nepal generally celebrate Guru Purnima by organising a day of cultural activities. Normally both teachers and students are involved, and depending on the age of the students, they should take the lead and organise some creative activities. Guru Purnima school celebrations typically take place in the assembly hall, decorated by students and teachers with flowers and posters featuring Guru Purnima related quotations. In order to celebrate Guru Purnima in school, students should also prepare gifts and greeting cards for their teachers, either as single students or as a group. Remember, celebrating Guru Purnima in school is not about spending money, so any homemade creative gift or greeting card will be greatly appreciated by your teachers. Guru Purnima in school can also be celebrated with an outing to a place of cultural interest such as the library, museum, theatre, or a classical dance performance. For a more traditional take on how to celebrate Guru Purnima in school, a nice idea is to organise a Kathak dance performance by students, or an explanation of the importance of the sage Vyasa, chants, recitations of the Guru mantra, and seeking the blessing of teachers by touching their feet. Parents might also be invited because, together with teachers, they represent the most important gurus in the lives of students. We have shown different styles of how to celebrate Guru Purnima in school. If you are an older student, you might be interested in how to celebrate Guru Purnima in college. Are you a college student or professor? How to celebrate Guru Purnima in college is different from how to celebrate Guru Purnima in school. 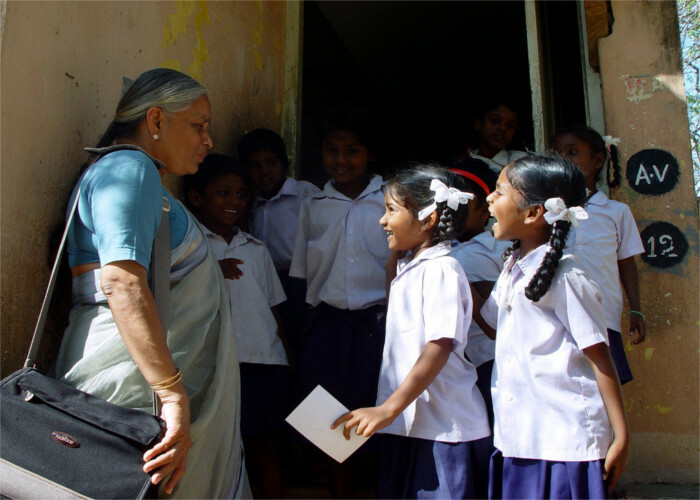 College students should take the lead and organise a special day for their teachers. Students can organise celebrations of Guru Purnima in college by working together as a class, or through the different students associations. For example, the literary association can prepare the speech, the theatre association can put together a representation based on Hindu mythology and so on. If students are well organised, they might even get funding by some local business, which would make how to celebrate Guru Purnima in college even easier. 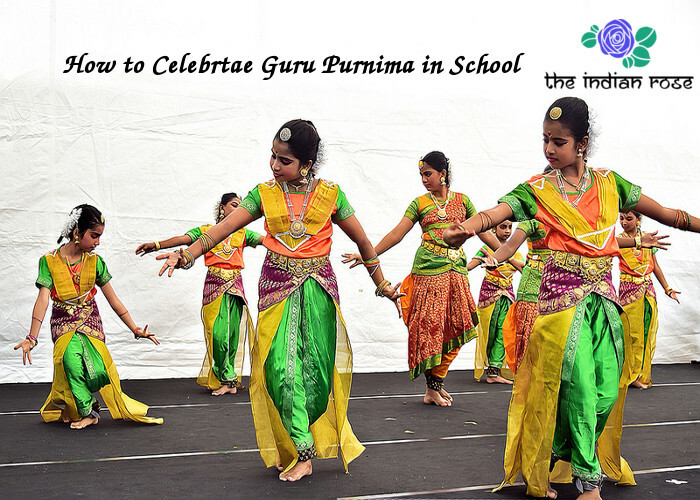 Let’s see what else you need to know regarding how to celebrate Guru Purnima in school. Now that you know all about how to celebrate Guru Purnima in school, you also need to know how to wish a teacher on this special occasion. In fact, apart from gifts, food and decorations, sending wishes is a key part of Guru Purnima celebration. Teacher, you are the guide towards our future happiness and success, so thank you for teaching us! Teachers like you not only teach academic knowledge, they also give students the confidence needed to take on life’s challenges. Without your love and perseverance, I wouldn’t be where I am now, thank you! Now you know how to wish a teacher on Guru Purnima, it will be useful in order for you to prepare teachers gift cards. Last but not least on how to celebrate Guru Purnima in school are gifts for teachers. Here is The Indian Rose list of gift ideas for teachers. Gifts for teachers on Guru Purnima are a big part of the celebration. A similar style present would be a beautiful bookmark, handmade is best! We hope you liked The Indian Rose Guru Purnima gift ideas for teacher, let us know any other gift idea you might have! We covered all aspects of how to celebrate Guru Purnima in school, hopefully we have been helpful! Guru Purnima is celebrated by Buddhists, Hindus and Jains every year on the full moon day of the Shakha Samavat in the Hindu calendar. This festival commemorates the goodness of spiritual gurus and teachers as thousands of devotees worship and thank their gurus for enlightenment.